Cheap K1200RS engine, 'box etc had to be bought. 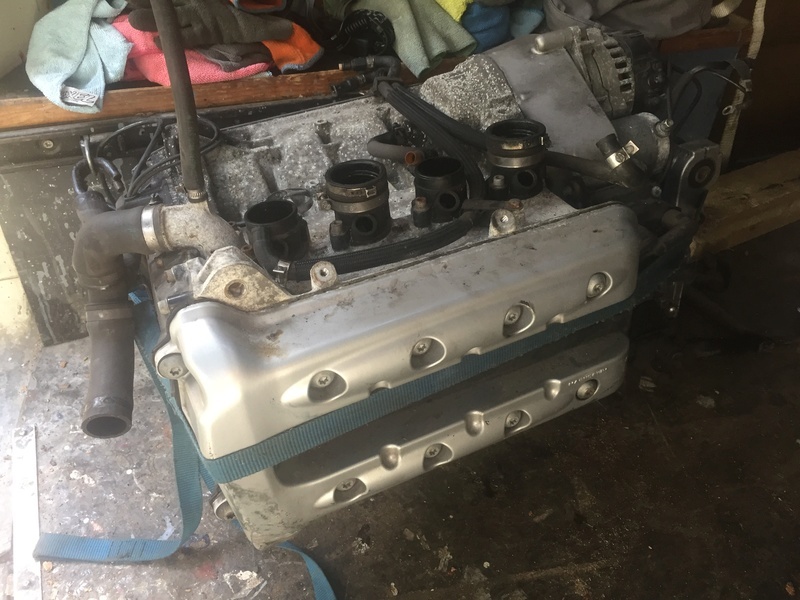 K100-forum.com » General discussion » Cheap K1200RS engine, 'box etc had to be bought. I've just collected a 27141 miles K1200RS engine, gearbox, loom, ECU, throttle bodies and oil cooler that came my way because I asked if a guy breaking a KRS had anything left-it's always worth the question. I don't know what I'm going to do with it yet but I'm sure I'll think of something. It is Charlie. I wanted to use the 6 speed gearbox but in all honesty I can't be bothered with the fabrication involved-I have too many projects on the go already. With a five speed 'bellhousing' and bits of K11 & K12 clutch it'll bolt right in to any K100/K1100 frame. It's an instant 130hp +/- from the usual 90/100hp...and the torque increase alone makes it worth it. @Two Wheels Better wrote: With a five speed 'bellhousing' and bits of K11 & K12 clutch it'll bolt right in to any K100/K1100 frame. It's an instant 130hp +/- from the usual 90/100hp...and the torque increase alone makes it worth it. I do have a spare motor that I could steal a bell housing from so it will end up in one of my K’s-probably my Flying Brick track bike. I’m also accumulating parts for a naked K special so it may end up in that too. It’s fate will be decided when I try the Flying Brick after rebuilding it when a cylinder head gasket failed earlier this year. I took the opportunity to clean the ports up and polish all the valves so I’m hoping for a slight performance gain as there was lots of thick carbon everywhere inside the ports and on the valve heads. The only difference between the 1100 and 1200 motors I have is 100cc as the 1100 has 1200 cams, throttle bodies and oil cooler. I wonder what different the long stroke 1200 lump would have over my present 1200ised 1100?